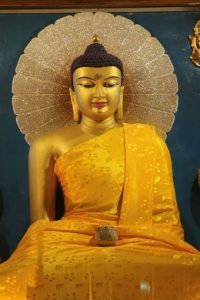 Yesterday evening we arrived dead tired at our hotel in Bodh Gaya. 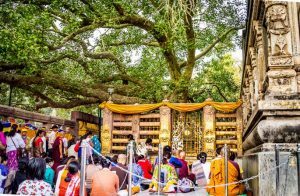 We were set on seeing the Bodhi Tree (Ficus religiosa). 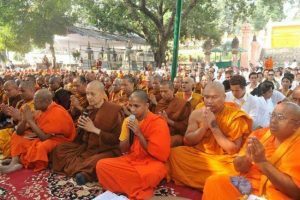 Therefore we walked to the Maha Bodhi Temple and found a large mass of people pressing foreward to enter. Sorry, but I couldn’t take pictures for it is forbidden to take a cell phone inside, nor an iPad. These are my only possibilities to take photographs. So we have to do with pics from the net. 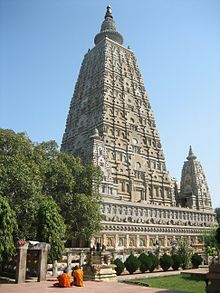 It was again king Asoka who built the first stupa here. And it was somewhere in the previous century that one very inspired person got all Buddhist societies in the world to write to the Indian government that these holy places should be placed in the hands of Buddhists. 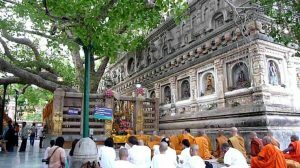 Now the Maha Bodhi Temple, as it is called, is a Unesco world heritage monument. And they take good care of it. We were sitting in semi darkness looking at the tree were we did our prayers (and got bitten by mosquitos). I was completely strung out. People had to tell me the meditation was over, otherwise I would still be sitting there. According to the lama I was blissed out. The next morning at 5:30 I went again to the temple and found a small spot in the ambulating passage around the stupa. 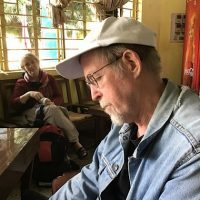 I was nearly in front of the tree (it is protected by a very thick concrete fence, ostensibly to prevent the tree from being destroyed by elephants) and the people were moving in masses in front of me. Sometimes they bumped into me and someone put a packet of biscuits in my meditating hands. At a certain moment everybody on the path were shooed away. Apparently a big shot was coming being announced by these typical Tibetan trumpets. As I looked up I saw the top lama of Buthan come by, recognizable by his saffron robe. 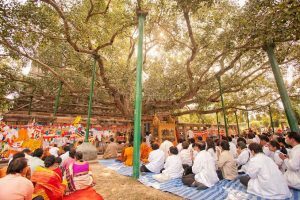 His duty the day before in Rajgir had ended and today he was going to do a major empowerment with hundreds of monks here at the Bodhi tree. Any way I meditated more than an hour on that spot and it seemed like only 15 minutes. After breakfast we went back again to do our prayers with a little shrine of our own. 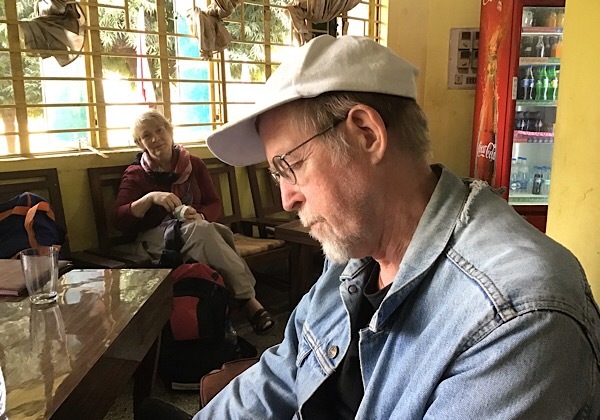 It took us quite a while to find a spot where we could hear each other, because there are constant prayers being sounded through loud speakers. After that we finally visited the statue inside the stupa, where every lama has to pay his or her respect. 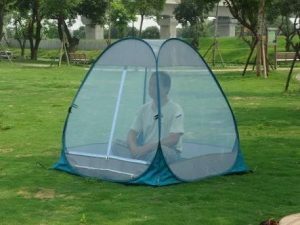 As I was bitten by many mosquitos the night before I went out and searched for a meditation tent and found one. I am very happy.